Below you can watch a 10-minute video that summarizes the recent 2012 Pastoral Theology module with audio excerpts. Without question, this was one of the best Reformed Baptist Seminary has offered so far. It was marked by a couple of "firsts." It was the first time we held a module in our newly designed (but not completely finished) virtual classroom. It was the first time we asked five speakers instead of one to carry the lecture load. 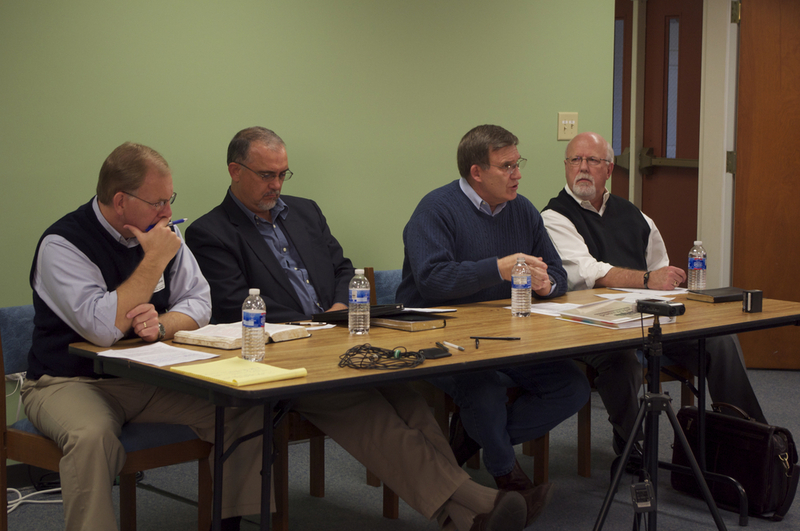 It was the first time we dedicated two sessions to a Q&A panel discussion with four pastors fielding a variety of questions. It was the first time we invited wives of two of our pastors to share with our students "a perspective on the pastoral ministry from a pastor's wife." It was also the first time I enjoyed the help of a professional videographer, Ryan Hobson, whom we've commissioned to edit and master all the lectures and sessions (coming soon!). I highly recommend all the lectures, the audios of which can be accessed on our Virtual Campus. To have four men with over 100 years of pastoral experience provide sound biblical teaching, wise counsel, and grace-filled encouragement and exhortations is a gift that most pastors never receive in seminary or life in general. Pastors training pastors…what a concept! The fellowship was sweet. We had 20 or more attendees for nearly every lecture. Eight of those attendees were students. Besides lots of fellowship during the 20 minute breaks between the modules, giving students a chance to get acquainted, we also enjoyed an evening stroll in downtown Greenville (a beautiful little city) and a sumptuous grilled steak dinner at the Selph's home with lots of theological discourse as well as some fun chitchat on the lighter side of life. It was a memorable experience, and I can only say, "I wish you were there!"